Has there been an escalating rate of smash-and-grab robberies in your community? Smash-and-grabs can be so difficult to solve and prevent due to the quickness of the crime. Robbers simply smash your storefront‘s glass and take as many valuables as possible before driving off. Many of the robbers wear masks and other items that hide their identity, making security footage even less useful. Security systems are usually triggered by these robberies but since they happen so fast, the police usually arrive too late. 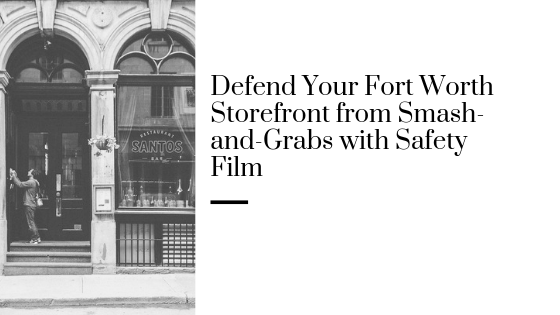 In order to really protect your Fort Worth storefront from smash-and-grab burglaries, you need safety and security window film. Safety and security window film offers a great preventative security measure that acts as a passive security system that never requires manual operation. Safety window film works by adding significant strength and flexibility to your existing glass. When high impact events occur, the safety film keeps glass fragments bonded together for a much longer time period than unprotected glass. This crucial amount of time added actually deters burglars and assailants from pursuing your storefront. Since security film makes it exponentially more difficult to break in while making a lot of noise that can draw unwanted attention, burglars tend to move on to their next target. 3M™ Safety & Security Film S140 Demonstration for Fort Worth Storefronts from Kansas City Green Window Film on Vimeo. GreenLight Window Films is proud to offer complimentary in-store consultations that better define your property’s specific needs. Our security team is comprised of incredible security experts in addition to civil engineers that can find the best security films for your property. In addition to product recommendations, we’re here to help you with strategic installations and specialty safety window film systems that offer better security. For more information regarding safety and security window film for your Fort Worth storefront, please contact us!